What Colour Should I Paint My Skirting Boards? For decades the classic colour for internal mouldings has been white, however, recently painting skirting boards a different colour has been on trend. In this article I will show you different ways to use colour on your skirting boards for different effects, and outline considerations for those who are pondering what colour to paint them. 1) Do you want to use strong or pale colours? 2) Are you trying to draw the eye to other features in that room (or on that wall)? 3) Do you need to inject a new colour into the scheme? 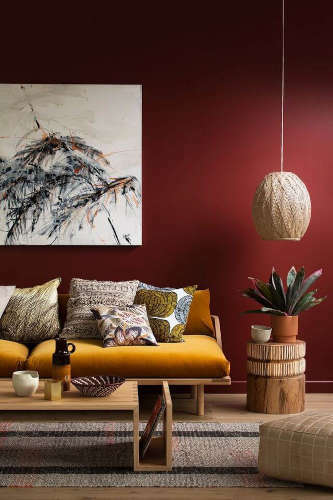 Colour schemes featuring deep, strong colours always stand out, whether the colour is used throughout the room, or just on a feature wall. However, a strong colour is often most effective when contrasted against a secondary colour. A secondary colour acts as a balance, and stop the primary, bold colour being too overbearing. White is a good primary or secondary colour to employ this technique with, and for this reason is why skirting boards are usually painted white. White will complement almost any other colour in your room. 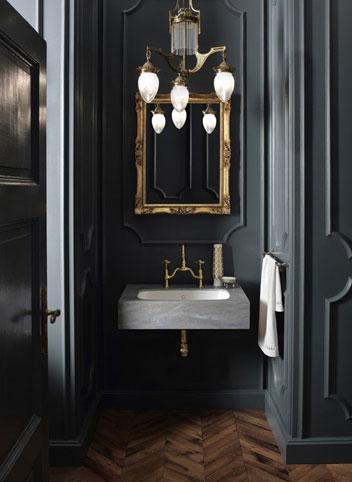 This can be especially striking when used with darker colour schemes, and can both brighten a room, and lift the tone of a colour scheme, while providing contrast. This contrast can be very effective, as it will serve to ‘frame’ the wall they are fixed to and provide an immediate, side by side colour contrast. I think the interior above does this very well. The white skirting in stark contrast against the blue wall colour, lifts what would other-wise be a dull scheme, but also gains continuity with the white pictures, light shades, throw and ceiling. 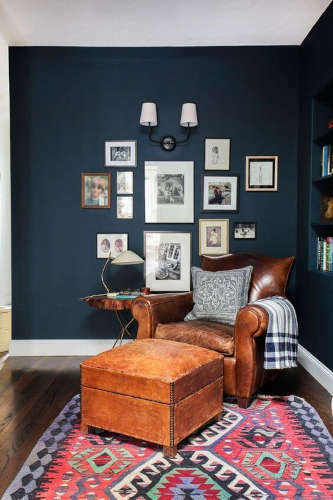 This provides a duel coloured foundation on which to introduce further feature colours, in this case being the leather furniture which particulaly draws the eye. The result is a powerful, but well balanced, contrasting interior. It is also important to note that contrasting effects can look equally effective with light coloured walls contrasting with dark skirting colours. Check out the black skirting boards in the interior below. However, contrast can also be pulled off well with lighter colours. 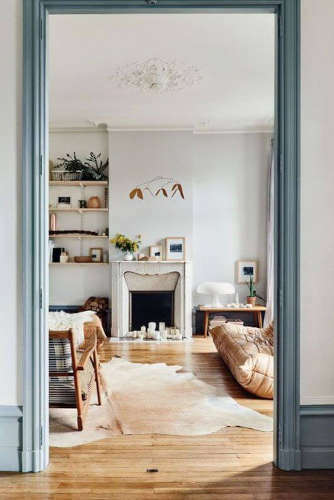 Painting mouldings and doors can be a really good way of bringing colour into the room – especially if you have white walls like in the image below. Continuity can be just as effective as contrast. Painting your skirting the same colour can deliver several effects. First it can deliver a borderless room opening up the space (particularly if light colours are used), and have a calming effect on an interior, by reducing the number of contrasts. It will also maximize the feature effect of a wall if it is one slid block of colour, rather than being trimmed with a white skirting board. Second, your wall can create a ‘background’ and give you a blank canvass on which to place a prominent feature or piece of decoration. The eye will then be naturally drawn away from the plain wall to the contrasting decoration. The features will be emphasised, as the eye won’t get caught by the contrasting colours of wall and skirting. The room below creates this effect well by using a small skirting board painted the same colour as the wall, with the eye being drawn to the yellow of the sofa, and the white of the art on the wall. The bathroom below also achieves this effect very well, with the eye being drawn to the mirror, light, sink and towel. A word of caution, colour contrast is an important tool when generating a colour dynamic, so don’t allow the continuity to go too far and overpower the room – it still needs to be balanced with some contrast. The key is to decorate/furnish the wall; bringing feature elements with art, pictures, mirrors, or positioning furniture in front of it. The floor colour also helps to bring contrast in all of these eamples. Compare the two interiors below and see the difference. The grey interior feels more balanced, despite the skirting being the same colour, whereas the blue in the second interior feels overbearing and somewhat empty. 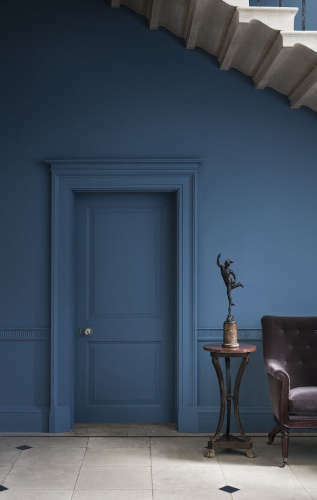 The examples we have looked at so far feature colour palates that are already use the skirting board colour elsewhere in the room, but what if you want to introduce a completely new colour? 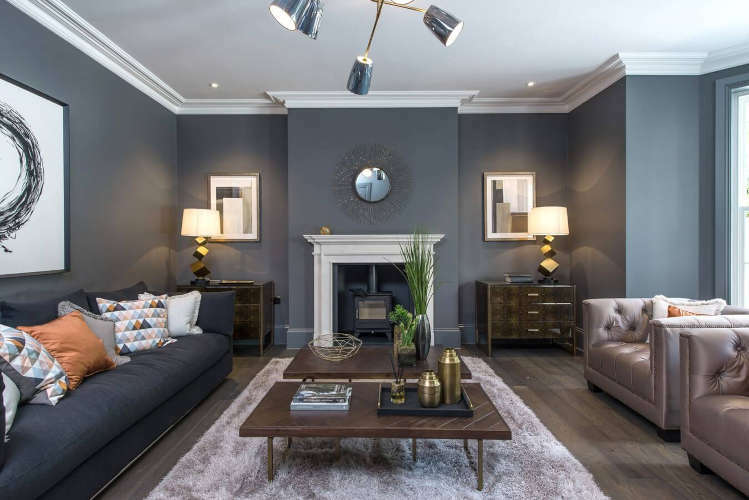 Without upsetting the colour scheme to much, one of the best ways of doing it is to introduce a new colour which is to introduce either a similar shade or tone of a colour in your room. This technique provides both further layers of colour with a limited contrast, but one that also maintains similarities with you original colour. This can be very effective method of introducing a new colour while still maintaining a balanced colour palate. Decoration can then be used to provide greater contrasts if neccessary. 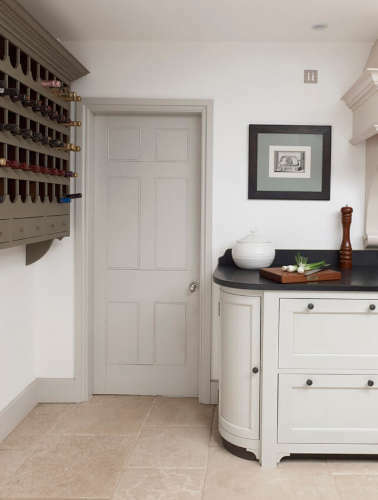 In the example below the grey coloured skirting is a slightly different shade to that of the kitchen units but shares a tone with most of the colours in the room, while the wine rack is a totally different colour, but maintains a similar tone. This guide should have given you some good ideas about how to select the right colour for your skirting boards, but Dulux and Farrow and Ball also offers great guide on how to create a colour scheme for your interior should you need more help.